As if getting the VSA installed wasn’t easy enough, VMware has made the VSA virtually (no pun intended) management free. 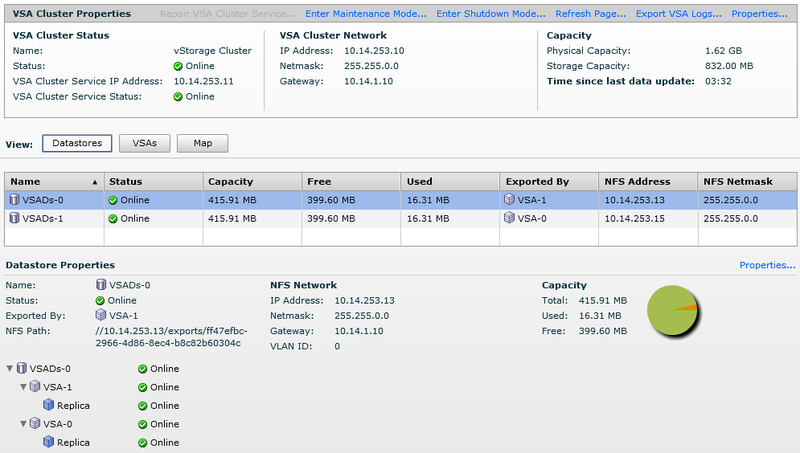 In the top window, is the VSA Cluster settings. All self explanatory here – the IP information your set during setup, and the capacity of your VSA storage. Above that is “Enter Maintenance Mode”, “Enter Shutdown Mode”. Clicking these here will put the entire cluster into the selected mode. (more on these modes below). Next, is the option to view Datastores, VSAs, and a Map of the storage. In the above image, the Datastores button is selected, showing my Datastores, and all the relative information. Here, you can see the status of each datastore (online), it’s capacity, used space, which VSA is exporting it, and it’s NFS information. (VMware’s VSA uses NFS to export storage, as opposed to HP/Lefthand using iSCSI). Then, with a datastore selected, you can the rest of the properties below it, including where each replica is. (Remember, you can have up to 3 nodes, so while it seems obvious with 2 nodes that my storage is mirrored on each, with 3 nodes, you will need this info). By selecting the VSAs tab, we will get our information relating to each VSA, and the ability to put each in Maintenance mode. Here, you can see that VSA-0 is exporting Ds-1, and holds a replica of Ds-0 – also, you can see which host each VSA is on. If you need to power down a host, you will want to first put your VSA on that host into Maintenance Mode. Maintenance Mode: This will put your VSA, or cluster if selected, into Maintenance Mode. 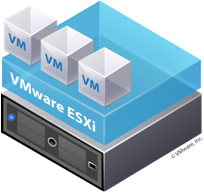 You will receive a warning that the VSA will no longer be exporting it’s storage (if selecting the cluster, all your VM’s will lose their datastores). If selecting to put a VSA into Maintenance Mode, the datastore it is exporting will be exported now by the other VSA – since they are replicas of each other. 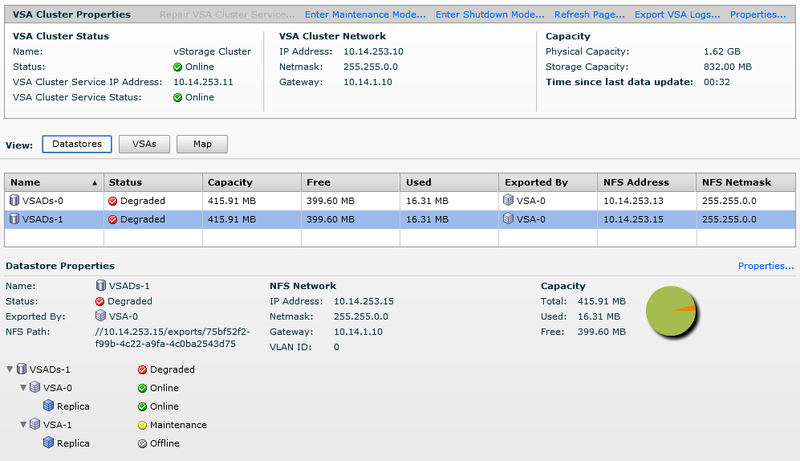 Now with VSA-1 in Maintenance Mode, our VSA cluster shows Degraded. You can see that both Datastores are now exported by VSA-0. We can now put our Host into Maintenance Mode to vMotion all VM’s to the other host. Once done with your maintenance, and the host is back online, simply select “exit Maintenance Mode” to bring your VSA back online and up to date with the replica. 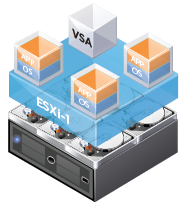 With VMware’s VSA, each datastore is exported by only one VSA. Even though the datastore has a replica, that replica does not handle any storage i/o for the VMs. VMware VSA uses NFS to export it’s storage to the hosts, not iSCSI. 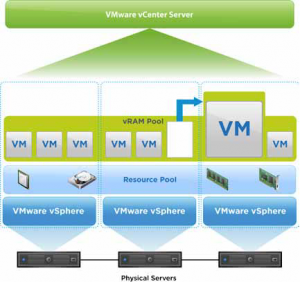 So, is VMware’s VSA right for you? If you are a SMB, maybe… see Justin’s post to see it compared to the HP VSA price-wise.